Best-selling author Dr. Myles Munroe takes you into the depths of praise and worship as he reveals the purpose and power of God?s presence?the established ideal atmosphere in which humankind was designed to function. From more than 30 years of ministry, teaching, and study, Dr. Myles Munroe presents rock solid, time-tested principles about the complex issues of praise and worship. In this engaging and authoritative work you will learn: The key to maximizing your potential on earth. Why God placed man in the Garden of Eden. The purpose and priority of the presence of God. The seven dimensions of praise. The purpose and power of personal and corporate worship. How to practice and protect the presence of God in your life. Much, much more! The Purpose and Power of Praise & Worship Expanded edition includes a comprehensive study guide with concrete, practical application for pressing in to a new level of relationship with God. With study questions and assignments designed for individual or group use, you will: Deepen your understanding of the biblical foundations of praise and worship. Easily apply key principles to your life. Want to practice praise and worship, both corporately and personally. 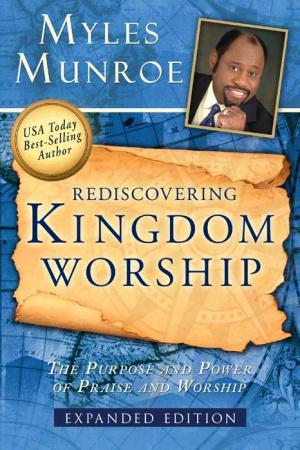 Rediscovering Kingdom Worship by Myles Munroe was published by Destiny Image in December 2010 and is our 27270th best seller. The ISBN for Rediscovering Kingdom Worship is 9780768432473. Be the first to review Rediscovering Kingdom Worship! Got a question? No problem! Just click here to ask us about Rediscovering Kingdom Worship.